Advantages: Excellent coverage of American aircraft in SAAF service during WW2, as well as of SAAF Sabres during the Koran War. In addition, this volume covers recent SADF Artillery developments (G5 & G6) as well as foreign volunteers involved in the Anglo-Boer War. To review a book produced by good friends is not an easy task, however, in this instance it has been a true pleasure. 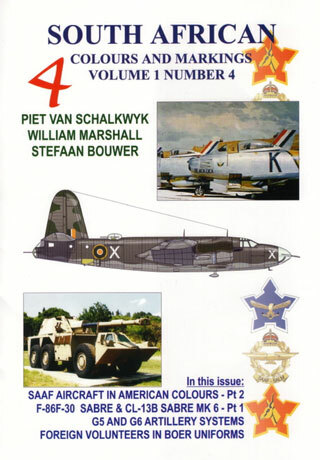 The SA Colours and Markings series of books have become the favourite reference source for modellers interested in the SAAF or SADF. In the case of the most recent volume (Nr.4) I am pleased to announce that this is the best in the series to date. For those familiar with the series, the authors have followed their standard layout, which includes a section on the SAAF in WW2, a post war SAAF period, a section on SADF armour and a smaller section covering uniforms used in the Anglo-Boer War. In the current volume the major focus of the WW2 section continues with camouflage schemes used on American aircraft in SAAF service. This section covers the P-40 Tomahawk and Kittyhawk, P-51 Mustang, B-26 Martin Marauder and the B-24 Liberator. Here considerable emphasis is placed on explaining the variety of American and British colours used. As these were at times used interchangeably, the authors once again reinforce the need to study actual photographs of the aircraft one wishes to model. In this regard the authors are to be commended on providing a host of new data, covering several schemes and markings, beautifully illustrated in a series of drawings, all backed up by many previously unpublished photos. The section on the Sabre in the Korean War is also very good, as it covers each one of the Sabres used by the SAAF. Several unusual schemes are included, of which that of a SAAF Sabre with a USAF sat studded tail is probably the most stunning. Aviation orientated modellers have in part criticised the inclusion of armour or uniform sections in this monographs. Personally, I have not viewed this as a deficit; but then again, I did not raise my voice in alarm over the inclusion of a Kettenkrad in the Tamiya Me 262 kit. To me it was fascinating to read of the number of foreign users now using the G5 and G6 artillery systems, or the modifications of these systems involving Indian Army T-72 tanks, where test firings have reached distances of over 40 Km’s. The section on the Boer War this time covers a number of foreign volunteers, including American, French, Scandinavian and Irish contingents. Although this may be of lesser interest to modellers, it does help us to reflect on why many of us do build models: because the history fascinates us. As such, delving a bit deeper to expose the roots can surely cause no harm or as my wife put it, “ A bit of history has never killed anyone”. In summary, this is another excellent volume in a growing series of excellent monographs with are not to be missed by anyone interested in the SAAF or SADF. The authors are to be commended on the depth and detail of their research, and for not just providing a rehash of previously published material. Many of the schemes illustrated were even unfamiliar to me. What more can a SAAF devotee ask for? Volume 5, please! Copies of this limited edition print are available from: www.aviationshop.co.za or directly from the authors at: mechinf@netactive.co.za.